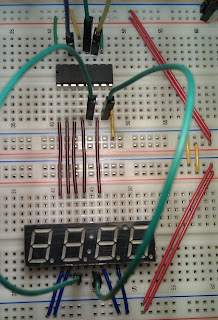 So now it's time to control a 7 Segment Display. I got mine from Sparkfun. There you can find the datasheet as well as some examples of how to use. It has 16 pins and for you to be able to use all digits, it multiplexes the anodes. 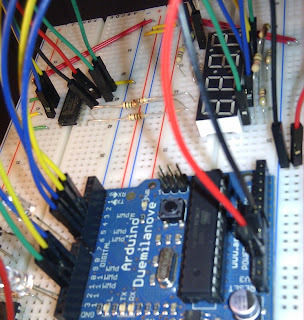 There's a cathode for each pin and 8 anodes for the digit segments and the following dot. 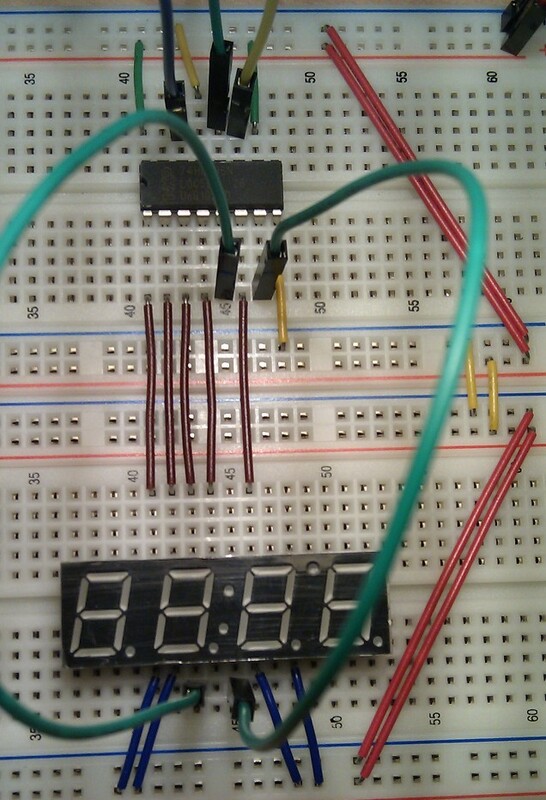 Because of these common anodes, we can only light up one digit at a time for them to show different results. To control it I used an Arduino connected to a Shift Register. 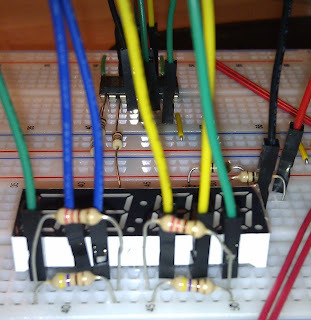 As its specs are 2.1V on 20mA, for the 5V output from the Arduino we need 150 Ohm resistors. I only have 3 at the moment, and there are 7 output pins on the display to connect to. So I used some serial (100 Ohm + 47 Ohm) and parallel (220 Ohm + 470 Ohm). 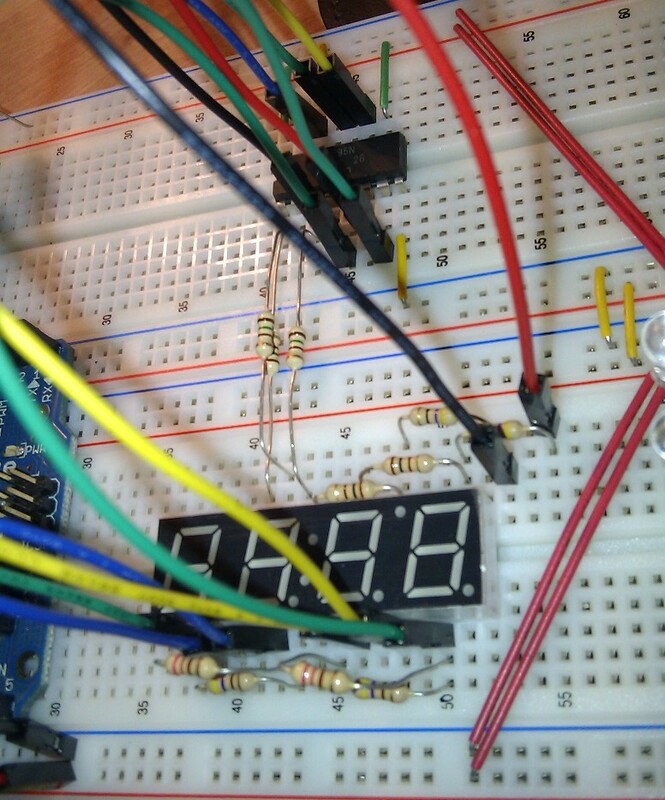 If you need to refresh your theory on calculating resistors or reading the values, hail to Wikipedia. This is the simplified circuit, without resistors, so that it is easier to view what the connections are. The basic usage of this setup is to control what pins from the shift register sink current from the displays anodes and which digit is lit on a given moment with the Arduino. // TODO: Can a 555 reduce these 4 pins to 1? I believe that this code could be more efficient (a quick side note - Performant isn't a word), so I'll look up ways to make it better. As a proof of concept, works just fine!